In this practical, enzymatic assays were used to determine the glucose concentration of patients in plasma samples. The use of enzymes as a marker for analytical analysis of plasma samples are very reliable due to the high specificity, reproducibility and sensitivity of enzyme assays (glucose HK assay kit). The first assay used is a glucose oxidase assay, this assay measures the glucose levels in plasma by using enzymes such as glucose oxidase to catalyse the oxidation of D-glucose which is present in plasma into D-Gluconic acid. The reaction is coupled to another chemical reaction where a reduced form of o-Diansidine is oxidised to an oxidised form of o-diansidine. This occurs in combination with a formation of hydrogen peroxide. The hydrogen peroxide is then broken down and reacts with H2SO4 to form a coloured compound that can be spectrophotometrically detected at a wavelength of 540nm. Another popular glucose measuring assay is the hexokinase assay. This assay catalyses the phosphorylation of glucose present in the sample in presence of adenosine triphosphate (ATP) by using hexokinase to form glucose-6-phosphate (G6P). G6P is then oxidised in the presence of nicotinamide adenine dinucleotide (NAD) to form 6-phospho-gluconate, this reaction is catalysed by the presence of glucose-6-phosphate dehydrogenase (G6PDH). While this reaction is undergoing, the NAD is reduced to NADH. This creates a colorimetric signal that can be detected at a wavelength of 340nm by a spectrophotometer. These assays are two of many assays used to measure glucose in patients. They are commonly used to determine if the patient is diabetic or for routine uses to monitor patients who are already diagnosed with diabetes. Firstly, 3ml of glucose oxidase reagent was prepared by adding 60µl of glucose oxidase, 30µl of peroxidase and 60µl of o-diansidine hydrochloride in 2,85 ml of 0.1 potassium phosphate to create a solution at a pH of 7.5. Then, 50µl of the samples (provided) and standards were added in duplicate on a 96 well plate as shown below (See Table 2.). Then 100µl of the assay reagent prepared earlier was added to each well. After 30 minutes of incubation at 37°C, the reaction was stopped by adding 100µl of sulphuric acid to each well. The plate was then read at 540nm on a plate reader. Results highlighted in red were omitted from further calculations due to preparation errors. 200µl instead of 100 µl of assay reagent was added to well A9, this diluted the signal creating an inaccurate result. The well was re-prepared in well C9 but the time interval between the substrate and stop solution was unequal to the duplicate in well A3, therefore, the result of well C9 was omitted from further calculations. Finally, the result of well B11 was omitted from further calculations since the assay reagent was not added to the well, therefore there was no chemical reaction (same value as blank). A standard curve can be plotted using the results generated by the wells containing the standards. Results are usually rejected if the difference in values is greater than 20% for more than 75% of the calibration standards. In this case, the precision of the curve is acceptable since all the CVs of the points (except from 1) are below 20 % (EMEA or Desilva). The accuracy and the precision can be further analysed by the quality controls (QCs) which were ran in duplicate on the plate. As shown above, the CVs of the QCs are below 20% meaning that the precision of the duplicates is acceptable. By extrapolating the mean absorbance from the QCs, the corresponding concentrations can be determined. QC performances are determined by calculating the precision and accuracy of these. The precision is determined as a CV% (CV%, where CV = SD/mean) and the accuracy as absolute bias (% RE, where relative error [RE] = [measured value – actual value]/ actual value). If these are between ±20% (±25% for low QC and high QC) and the target total error (sum of these two values) is below 30% (40% for low QC and high QC), then the results generated from the standard curve are acceptable (De silva EMEA). Following the results shown above, it can be determined that the precision and accuracy of the results are acceptable for each control. Once this has been determined, the results generated from the samples can be analysed reliably. Due to time constraints, the hexokinase assay was not performed. Despite this, some results were provided to determine the glucose concentrations of the 3 patients. The bias calculated is within the 20% range meaning that the assay is accurate and the results generated are validated. 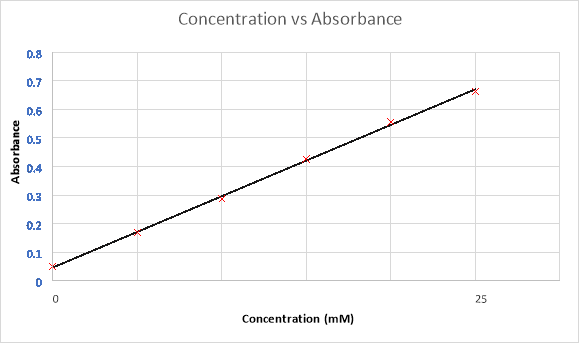 Finally, by extrapolating the provided absorbance of the samples on the standard curve, a corresponding concentration can be determined. The results obtained by the glucose oxidase assay are very different from the hexokinase assay, even though the accuracy and precision of both assays are acceptable. Meaning that there must have been an error in preparation of the samples, standards or controls of one of these assays. It has been predetermined that a preanalytical error was made during the storage of the patient samples prior to their use in the glucose oxidase assay. The samples were thawed and not kept on ice which degraded the samples, this explains the low values for the patient concentrations. Due to the abnormal results obtained in the glucose oxidase assay (t=1 and t=2 decrease in glucose concentrations for patient 3), the results were omitted from further clinical interpretation. The results provided in the hexokinase assay seem to be more correct (increase in glucose concentrations from t=1 to t=2). Taking this into account, the results obtained from the hexokinase assay were used for the clinical interpretation of the patients. The paired samples which were ran on the assays were samples collected during a glucose tolerance test. A glucose tolerance test (commonly called GTT or OGTT) is performed on a patient to help diagnose diabetes. It is used to help diagnose disorders such as pre-diabetes, insulin resistance, gestational diabetes (for pregnant women) and reactive hypoglycaemia for example. The test involves the administration of a glucose dose (usually 75g in liquid form) to a fasting patient. Blood is taken before the ingestion of the dose and 2 hours later. The results from the blood glucose levels help determine glucose disorders(ref). GTT is a widely-used tool for diagnosing gestational diabetes. It is offered to women who are 24-28 weeks pregnant and present a risk factors such as an elevated BMI, family history of diabetes or a previous pregnancy of a large baby. Patient 1 is a 36-year-old female who is 28 weeks pregnant. She was offered a routine GTT following the last pregnancy since the baby was large. Her fasting glucose was 7.43 mmol/L and her blood glucose levels after 2 hours was 11.6mmol/L. In the UK, according to the National Institute for Health and Care Excellence (NICE) guidelines, a fasting glucose greater than 5.6 mmol/L and/or a 2-hour blood glucose level greater than 7.8mmol/L for pregnant women is considered diagnostic for gestational diabetes (NICE guidleines). Therefore, the patient in question is diagnosed with gestational diabetes. Patient 2 is a 67 year old female, she was referred for a GTT following the results of her fasting plasma glucose to be 5.6mmol/L at a routine GP check-up. According to the results from the hexokinase assay, her fasting glucose was 5.27mmol/L and her 2-hour plasma glucose levels were 8.44mmol/L. These results indicate that the patient has an impaired glucose tolerance (fasting glucose less than 7mmol/L and 2-hour plasma level between 7.8 and 11.1mmol/L). This diagnosis is given when the results do not indicate diabetes but are still abnormal. Further check-ups need to be planned to routinely check for diabetes. Patient 3 is a 24 year old male. He is affected by cystic fibrosis which requires annual pancreatic function tests such as GTTs. His fasting blood glucose levels were 5.57mmol/L and the 2-hour blood glucose levels were 6.45mmol/L following these results it is safe to say that this patient is healthy (fasting plasma levels less than 5.5mmol/L and plasma glucose levels at 2-hours less than 7.8mmol/L). By using an enzyme assay, blood glucose levels from patients can be monitored. These assays are reliable due to the specificity, reproducibility and sensitivity of the enzymes. By measuring the glucose levels of samples before and after the administration of an oral dose of glucose, the results can help diagnose several types of diabetes such as gestational diabetes in pregnant women. There are a variety of available assays that can measure glucose from serum samples, but they all function on the same principle of catalysing a reaction to produce a detectable signal that is correlated to a concentration. The use of internal quality controls is an indispensable way of testing the reliability of the results. "Diagnosing Diabetes Mellitus." UKEssays.com. 11 2018. All Answers Ltd. 04 2019 <https://www.ukessays.com/essays/sciences/diagnosing-diabetes-mellitus-8729.php?vref=1>. "Diagnosing Diabetes Mellitus." All Answers Ltd. ukessays.com, November 2018. Web. 22 April 2019. <https://www.ukessays.com/essays/sciences/diagnosing-diabetes-mellitus-8729.php?vref=1>. UKEssays. November 2018. Diagnosing Diabetes Mellitus. [online]. Available from: https://www.ukessays.com/essays/sciences/diagnosing-diabetes-mellitus-8729.php?vref=1 [Accessed 22 April 2019]. UKEssays. Diagnosing Diabetes Mellitus [Internet]. November 2018. [Accessed 22 April 2019]; Available from: https://www.ukessays.com/essays/sciences/diagnosing-diabetes-mellitus-8729.php?vref=1.